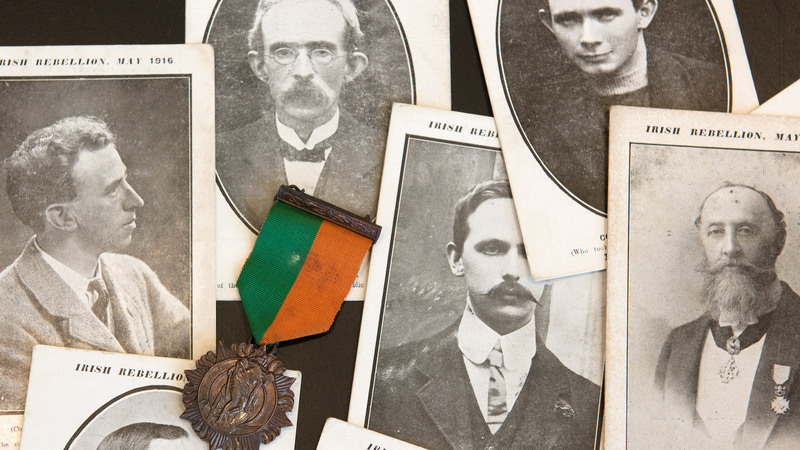 In addition to the artwork on display in the museum, Quinnipiac University houses a significant collection of printed materials relating to the starvation that occurred throughout Ireland from 1845–52 and the forced emigration during these years and beyond. 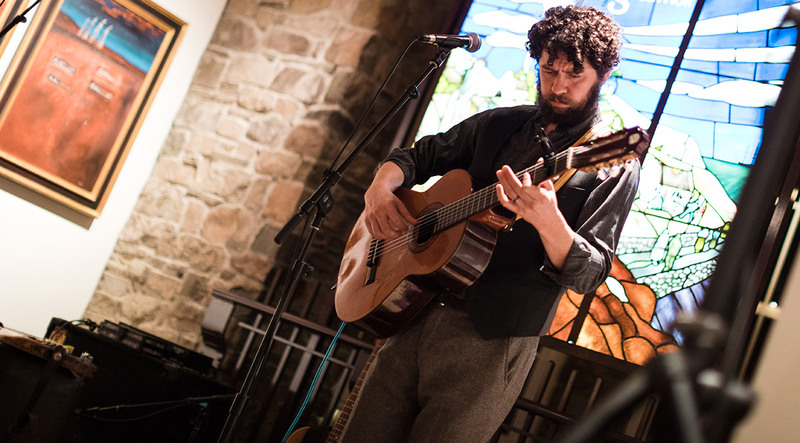 This collection is available in the Lender Family Special Collection Room located in the Arnold Bernhard Library on the university’s Mount Carmel Campus. Some of the volumes housed in the Lender room are extremely rare and were written at or close to the time of the Great Hunger. Others include tragic and moving accounts and personal recollections taken from letters and diaries of the period. Present-day authorities and scholars, historical novels, essays and personal reflections contribute to the record. Quinnipiac University continues to build on this valuable resource for scholarly research and for educating people on the reality and implications of this tragic period in human history. 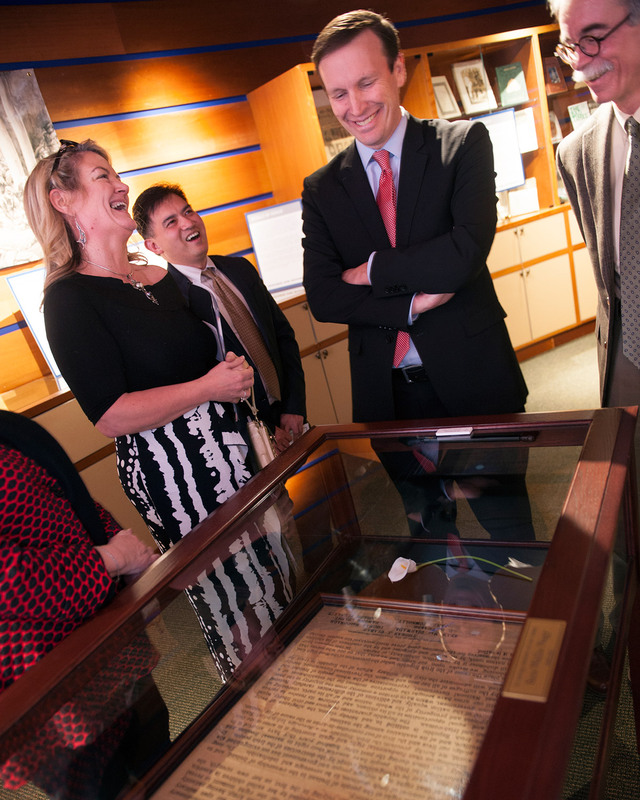 Caroilin Callery, director of Strokestown Park House and Famine Museum, Quinnipiac University librarian Robert Joven, U.S. Sen. Chris Murphy, D-Conn., and Quinnipiac Professor Michael Chiarappa, co-curator, from left, admire a full Proclamation of the Irish Republic, on loan to the Ireland’s Great Hunger Institute by Caroilin Callery's father, Jim Callery, on the opening night of "The Seed of the People: 1916 Remembered" exhibit Tuesday, Mar. 22, 2016. The British Parliamentary Papers relating to Ireland from 1801–93 is a highlight of this collection. Consisting of some 4,500 individual items, including bound volumes, individual reports and administrative files, these official papers document various aspects of life in Ireland during the 19th century: the people, their land (or lack of it), education, rebellions, famines and religion. The collection also features the rare four-volume, the Bogs of Ireland, 1812–19, which include 68 magnificent maps of Irish bogs, a copy of the six-volume set on the Disturbances in Ireland published in 1825, and a complete set in 12 volumes of the Parnell Commission. 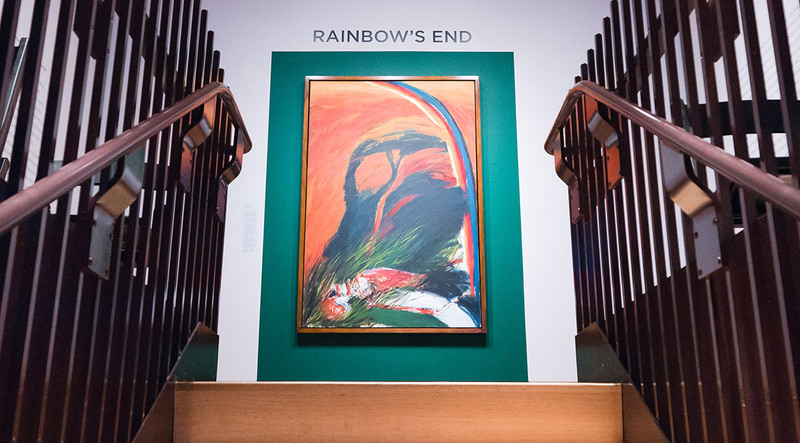 The room was dedicated on September 21, 2000, in honor of Murray Lender, Marvin Lender and members of the Lender family, whose generosity and dedication to promoting education and public awareness about the Great Hunger made the collection possible. 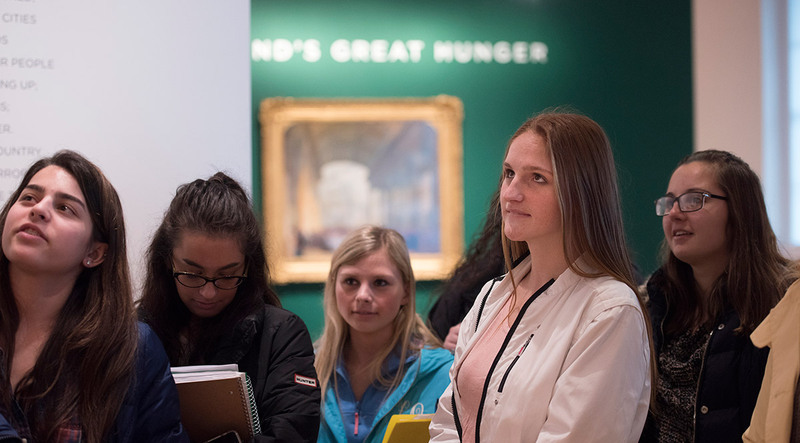 Established in August 2013, Ireland’s Great Hunger Institute fosters a deeper understanding of the Great Hunger, also known as An Gorta Mór—the famine that devastated Ireland from 1845–52. The institute is a scholarly resource devoted to disseminating information about the Famine, its causes and consequences through a strategic program of lectures, conferences, course offerings and publications. 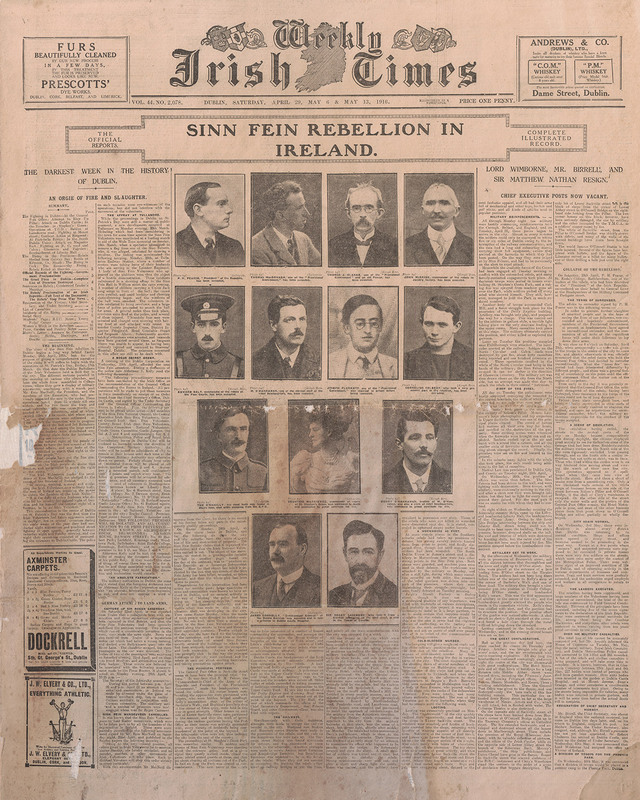 The Weekly Irish Times dated May 1916 was the first paper to be published in Ireland in the wake of the Easter Rising. Our digital database contains about 1,500 articles and illustrations related to Ireland and the Great Famine, the worst demographic catastrophe of the 19th century. To request high-resolution images from the database that are suitable for publication, please complete the form below.